"Every guitar has got a pile of songs in it, you just have to find them"
Glenn’s “Gimme Guitar” documentary is available on DVD. This exciting video was produced, shot & edited by Glenn. It features interviews & performances of over 25 guitar players. The runtime of program is 57 minutes & the DVD has over an hour of extras. This 2 minute trailer will give you a fun sample of the feature. 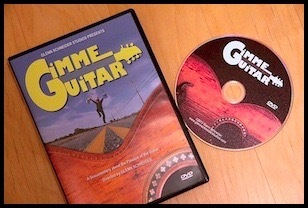 Gimme Guitar explores 25 guitarist's passion & love of guitar. It features well known players Marc Rizzo, Blondie Chaplin, Rusty Paul, Carl Harvey & Gunter Schneider. It features Hamptons musicians Nancy Atlas, Johnny Blood, Matty Liot, The Montauk Project & Dan Bailey Tribe. It features NYC blues talent Michael Powers & Daniel Lane, No Discipline reggae specialists Mike Bazaz & Al Bazaz, Sanjay Subramanian, Glimmer Twins Bernie Bollendorf & Michael Rubino, Yankee's organist Ed Alstrom, Amp builder Andy Fuchs, Classical guitar builder Gary Lee, Lark Street Music guitar shop owner Buzzy Levine, Spring, Monroe Quinn & Jill Richmond. Special appearance by Chad Smith. Gimme Guitar will leave you wanting more. The video is educational & entertaining with original music to prime your interest of these great guitarists. It will probably inspire you to start playing guitar or to get better if you already play. Send $11.00 check to: NJ LABEL, Attn: Janice Schneider. *** Shipping to continental USA only.